Remnants Season of Wonder by Lisa T. Bergren. A Remnant Book. Review: What is it like to have the world's fate on your shoulders? Lisa T. Bergren hands us a promising new book, Remnants; Season of Wonder, where the wasteland of Earth's ghost, teetering on the edge of darkness, is painted through Andriana's eyes. A promising start of a new series, this book will surely attract attention from across the nation. Andriana is special. Not just any sort of special, but truly special. She was born on the 7th day of the 7th month on the 77th Harvest, and since birth, has been destined to defend the human race from the abominations that infest their lives. Andriana, her knight protector, Ronan, and only a few other remnants, must travel far and wide to help all sympathetic to their cause, while fighting the evil that has caused so much wrong. Danger and the Sons of Sheol close in on the Remnants and Knights, endangering all of humanity. Even as the peril inflames, Andriana finds that her feelings for Ronan soars. She must control her feelings in order to avoid jeopardizing the mission, lest she doom the entire human race. Remnants; Season of Wonder is generally, a good book. The action, the adventure, and the intrigue within the cover will capture the attention of all readers. However, there are some cons that several readers may have concern of. The romance associated with the story will dull the experience for several boys. Inferred from the romance, the book will be generally more suited for the girls, ages 13 to 18. Despite this, there are several other things that must be accounted as good in Remnants. The storyline is well thought-out, has many rather interesting events within the plot, and interesting characters with distinct personalities. The storyline, (much of which I will not reveal) had well-positioned events that add excitement and shock to the reader, along with several moments of combat and romance, both positioned in several fine places along the plot as a good attempt to provide the same amazing experience for both genders. There were many plot twists and story game-changers that occurred within the storyline, along with several discoveries made by the Remnants that will remind us of our everyday life, and how much has changed. Many of the characters were not forgotten, but instead were given distinct personalities that will give each a discrete feel. A list of an example would be Niero, Vidar, Bellona, and Killian. (Sorry, not revealing the personalities, you have to find out yourself!) Overall, Remnants; Season of Wonder, is a great start for any series, splendidly showing lots of promise and potential. Even though I've never quite read a ÒromanceÓ book, it certainly shows lots of promise with the unique blend of combat and romance. As you dig deeper into the story, you will understand that it is worth the time and money to get the full series. (Or wait.) Lisa T. Bergren has certainly started a new series proudly displaying lots of promise and much of that feeling that we would call excitement. We would like to thank Blink for providing a copy of Remnants Season of Wonder for this review. 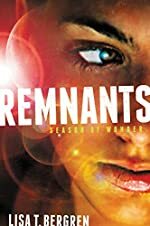 Have you read Remnants Season of Wonder? How would you rate it?